My latest blog post on Lehman's is now up. Hop over and take a peek. Also, last weekend's article on WND entitled "If the service is free, you're the product" was featured on the carousel on Saturday. For those unable to read the column on WND, it's copied below. America, and possibly the rest of the world, is still reeling in shock at what is being called "worst breach of privacy in modern history." Forget the old mundane stuff like swiping credit card numbers or bank account passwords. Now we're learning that everything – and I mean everything – ever loaded onto Facebook has been mined and stored away. Facebook's Mark Zuckerberg admits the company "could read and censor the private messages that you send to your friends." Users are understandably horrified, and trust in the social media company is in free fall (along with Facebook stock). Company personnel are in massive damage-control mode, explaining the data mining is for the children. "Keeping your messages private is the priority for us; we protect the community with automated systems that detect things like known images of child exploitation and malware," a spokesperson said. "This is not done by humans." The funny thing is how sputteringly defensive these tech people get whenever someone objects to their actions. After all, what do we have to hide? "The reality here is that if you want to build a service that helps connect everyone in the world, then there are a lot of people who can't afford to pay," Zuckerberg said. "And therefore, as with a lot of media, having an advertising-supported model is the only rational model that can support building this service to reach people. … But if you want to build a service which is not just serving rich people, then you need to have something that people can afford." 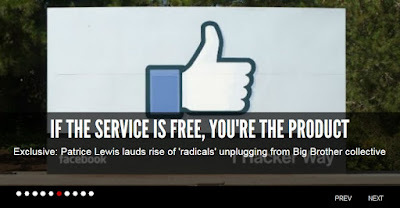 Sadly, Zuckerberg is right about one thing: If the service is free, you're the product. "Of the myriad critiques of the computer culture," noted a 2015 Washington Post article, "one of the most common is that companies are getting rich off our personal data. Our thoughts, friendships and basic urges are processed by computer algorithms and sold to advertisers. ... That information is valuable. A frequent gibe is that on Facebook, we're not the customers, we're the merchandise. Or to put it another way: If the service is free, you're the product." Finally – at last – people are waking up to how unpleasant it is to be a "product." Although our world is now so interconnected that it's all but impossible to disconnect completely, some people are waking up to the dark side of technology. "Political progressives once embraced the utopian promise of the Internet as a democratizing force," says the Washington Post article, "but they've been dismayed by the rise of the 'surveillance state,' and the near-monopolization of digital platforms by huge corporations." Preach it, brother. Why is it necessary to know so much about everyone? The trouble is, being a product is so easy. It's so convenient to take smart phones everywhere we go. No one reads books anymore; they're all too busy staring at screens. You don't even have to store photos or text on your computer; it all goes into the cloud. Facial recognition software identifies everyone, no matter where they go. This desperate desire to mine data from Joe Sixpack is getting crazier and crazier. Homes are becoming "smart" and brazenly advertise their Internet connectivity – not just computers and phones, but also refrigerators, washing machines, dishwashers, vacuum cleaners, thermostats, heating/cooling systems, security systems, lights, televisions, stoves, ovens, coffeemakers, speakers, toys, and even (ewww) a "smart mattress." Is all this really necessary? Even more pointed, is all this even desirable? Doesn't anyone realize the scope for abuse from malicious hackers or viruses? It's literally to the point where hackers (or the government) could cause your home to hold you hostage. In the 2008 Pixar film "WALL-E," Earth is garbage-covered and abandoned, with its population evacuated onto starliners. According to the Wikipedia summary, "the descendants of the ship's original passengers have become morbidly obese after centuries of microgravity effects and relying on the ship's automated systems for their every need." Is this where we're headed? As one person put it, "It is exhausting just to think about. Constantly having to worry about what you say, do, even think now becomes a worry as to who may be listening or monitoring in order to 'catch' you. It certainly is a good way to make us slaves by our own hands." Remember this: Every keystroke you make is measured, recorded, documented, and stored somewhere. Every website you visit, every phone call you make, every text you send, every email you receive, every bank account you balance – everything is recorded. You're a product, and your cooperation is required. "There are days when you have the impression people are treated as battery animals or experimental rats," said Giovanni Buttarelli, the European Data Protection Supervisor, about Facebook. "We are treated as a farm for data. We are in within a walled garden and every single action is monitored." Whether Facebook eventually collapses under the weight of its own arrogance remains to be seen, but it hardly matters. Another "free" service will arise to take its place, to which people will flock in droves. "Free" is just too irresistible, and people seem to enjoy being self-lobotomized. It's now a radical, subversive thing to go (or remain) low-tech, but a growing number of people are deciding it's not worth being a "product" and are opting out. Forget the smart appliances. Forget the smart phones. Forget the seductive, addictive dumbing down of personal electronics or wi-fi appliances. These tech dissenters are engaging in radical behaviors such as face-to-face conversations, reading a good (physical) book, and walking in the woods unaccompanied by a digital leash. But most people won't take that step backward. And when they've left all their actual physical friends behind, I suppose "Alexa" or Google Assistant will be all that remains. But if that's the path you choose, just remember this: When free stuff means you become the "product," the next step is inevitable. A product isn't free. It's owned. Janet in MA has the right idea. Never give correct information, always remember what they are going to use it for. It goes against the grain of this audience to lie, but in this particular type of circumstance, I believe it to be more than justified. I'm actually pretty happy about all of this. It will make it much easier for many of us to stay under the radar, because as people will get more and more complacent, so will the data gatherers. It's not that hard to have a low (or no) profile. Guard your information jealously, I can absolutely guarantee that large companies make promises that they NEVER intend to keep. No one ever teaches that stuff though.... That keeping your info to yourself is wise. You're not cool if you're not socially connected. Especially to Young people who are all lonely and think a"like" means you have friends. I know well educated people who cannot disconnect. They literally cannot do it. I drove around with no cell phone and people think I'm crazy. IT'S SO DANGEROUS!!!!! Right. I know. I know. I personally hate technology and what it is doing to people. To families. To the future. It makes me happy to see people actually talking to each other in public. And I'm thrilled that my children have imaginations because they don't have their minds stolen by some screen. What on earth IS this thing?